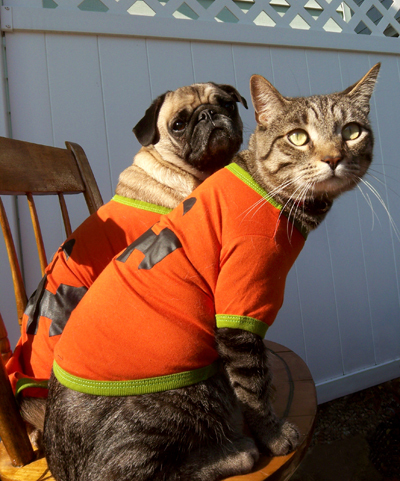 Oscar and Stewie say Happy Halloween! I wanted to make these into postcards but ran out of time. Maybe next year. I think they are cute enough to repeat. WOW Stewie is as big as Oscar. Too Cute!! Great costumes! Do you guys get to wear them all day? I wish we got trick-r-treaters here. Give 'em lots of candy and tail-wags for me. They are so cute, but how on EARTH did you get that onto your cat? My cats would have KILLED me! 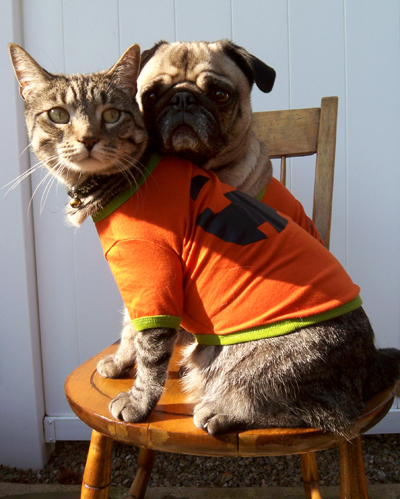 They are so cute Happy Halloween. awesome! I got a few shots of Salem in his witches cape and hat a couple of years ago....ive been sleeping with one eye open since....it looks like your guys enjoy it though! Wow, it's incredible that you got them both to wear costumes and pose together like that! Great photo!